We are the leading manufacturers, exporters and suppliers of an optimum quality grade of Henna Leaves And Powder. 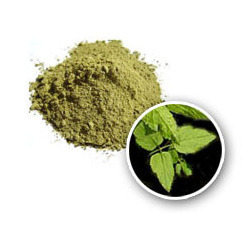 Offered Henna powder is widely used for coloring purposes at marriages and also effective for hair. This Henna powder is processed at our well-furnished manufacturing unit, using premium grade of Henna leaves and innovative processing technology. Provided Henna powder is checked by our adroit quality inspectors in compliance with various quality check parameters. Incepted in the year 2007, in Rajasthan, India, we “Megha Products”, an ISO 9001:2008 Certified Company, are the distinguished Manufacturer, Exporter and Supplier of wide assortment of Henna Leaves And Powder, Aritha Powder, Shikakai Powder, Amla Powder, Neem Powder, Tulsi Powder, Vinyl Sulfone Dye, Herbal Hair Color Powder, etc. Our offered products are processed using high quality herbal ingredients that are sources from authentic vendors of the market. These products are widely demanded as cosmetic and medical product to treat several skin and hair related problems. Our offered products are mixed with lemon, water, milk, curd, tea and other such liquid for easy to use and effectiveness. We provide these products to our clients in safe packaging options to provide their safer delivery at user’s end. Moreover, these products are stringently checked on series of quality parameters before being supplied to our clients. Our offered products are exported to countries like China, Japan, South Africa, Kuwait, Moroccaon, Sri Lanka, USA, UAE, Romania, Turkey, etc.